This post by Shannon Orcutt is cross-posted from the Save Darfur Coalition/Genocide Intervention Network blog. 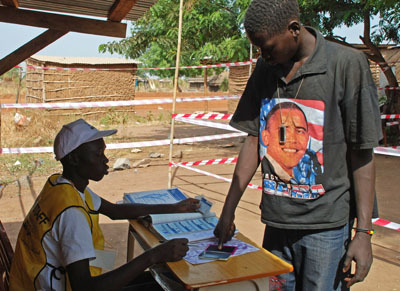 In September 2010, the Obama administration presented a package of incentives to the Government of Sudan in exchange for progress on the full implementation the 2005 Comprehensive Peace Agreement, or CPA, credible and peaceful referenda on southern secession and the future of Abyei, an agreement on post-referendum arrangements, and the resolution of the Darfur conflict through a peace agreement that is credibly implemented. However, since the United States introduced these incentives, Sudan has not made significant progress and has in fact regressed on several key issues including CPA implementation, post-referendum arrangements, and resolution of the Darfur conflict. Despite negative progress, Khartoum still expects to receive these rewards. While the referendum in South Sudan went exceedingly well and the National Congress Party led by President Omar al-Bashir did not obstruct the process, one positive step is not enough to merit extensive rewards. The removal of Sudan from the State Sponsors of Terrorism List and the normalization of diplomatic relations should go forward as long as they are in accordance with key stipulations including resolution of Abyei and certification that Khartoum is not supporting the Lord’s Resistance Army. Resolves remaining post-referendum issues such as the status of Abyei, demarcation of the borders, as well as disagreements over citizenship, security, oil revenue, and currency. Read the full paper, and take action in support of these asks.